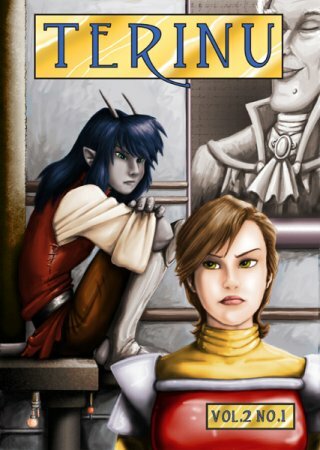 A quick note first -- I was extremely pleased to discover Peta Hewitt and her comic book series Terinu. Finally, I was no longer alone as a creator of graphic fantasy adventure, no longer the only person to create a long running series that can be enjoyed by people of any gender and age. And, it was in perfect complimentary style -- she creates sci-fi adventure, while I create anthropomorphic fantasy adventure. I'm proud to know such a fine, dedicated artist. Terinu Vol 1, issues 1-6 -- where to begin without giving too much away (because as every keen reader knows, sometimes even the smallest plot detail or revelation can be a thrill to discover!)? So here goes in a nutshell: Leeza, cousin Lance (both human), and Rufus (fox-like humanoid) accidentally meet up at a space refuelling station. Leeza is trying to hunt down a part for her ship when trouble breaks out and the strange, grey-skinned, elf-like youth Terinu crosses their path. He has just escaped his captors after being sold at an auction. To survive the strange situation unfolding, they reluctantly work together while also being chased by a reptilian military force for an unknown reason. Leeza and friends escape on her ship Treona after discovering that Terinu can generate great amounts of energy, not only to evade his captors, but also to power up a ship. Barely having time to stop and rest, the crew and Terinu go from one adventure to another, including thwarting an invasion attempt of a mining colony by the reptilian Galapados Warriors and their mysterious master, the Varn. Why the Varn desperately want to capture Terinu is revealed, as is their previous history as the not-so-nice rulers of a vast empire. But to say any more would be to spoil your enjoyment of a fast-paced, action packed story with real characters that are well-defined, and events that unfold in such a way that brings these characters, their personalities and ideals, to life. Leeza is a wonderfully strong and independent woman -- someone who can take control of a situation regardless if she has help or not. But her sensitivity and perceptive nature give her an approachability and warmth that allow her to diffuse any volatile situation, which she does often enough with Terinu and her simple (in a good way!) but loyal and courageous cousin Lance. Lance is the kind of dependable guy you'd want tagging along when walking down a dark street! So that's the first 6 issues of Terinu. All are beautifully illustrated, lusciously inked and lovingly detailed. Peta Hewitt's ability to work with colour, using good old-fashioned pen, pencil, inks and markers and modern computer techniques stands out as an example of her amazing adaptability and ability to learn new methods quickly. Her willingness to experiment also allows her to grow greatly as an artist. Just take a look at her amazing catalogue of stand-alone coloured illustrations of her Terinu characters, other miscellaneous character designs and 'exchange art'. Just follow the links from her site and be prepared to spend hours admiring her work. Now I should finally get around to reviewing Terinu, Issue 1, Volume 2. I've waited a long time for this -- I loved the first series, and it's a great jumping-in point, but my real desire is to get to know Terinu and crew a lot better, and not at such a frantic pace! I'm also the kind of person who cries out for more characters, because I know Peta can make them not only interesting to look at, but interesting to know. Besides, she's going to need them given the scope of her story. Firstly the cover: computer coloured with a hand-painted and airbrushed look. A warm blending of strokes and colour without the commonly used black outline. It has a very 3D effect and feels like the kind of painting more commonly used in illustrated children's books. A definite standout over other comic book covers, and my personal favourite so far. It has an overall tense feeling about it, with Terinu and Leeza in deep thought, while the situation is lightened by a smug portrait of a new character, Nefreeti, a somewhat Liberace kind of guy with just as fun a dress sense! The story begins with the Varn leader and his loyal reptilian general Gisko discussing the failed invasion of a mining colony (from the first series of Terinu). It's good to see the so-called 'bad-guys' in their natural setting, getting a chance to understand why they do what they do without judging them simply as bad (again, something that rarely happens in mass-marketed comics). Then we meet up with Terinu and the gang as he recovers from injuries sustained in the last series. But he doesn't stick around for long, leaving his new friends behind because he is yet to allow them to be his friends... with the exception of Leeza who convinces him to remain with her a bit longer. She offers to help him 'avoid' not only the people who 'bought' him at auction, but also the Varn and the new threat of the 'pirate' gang he was once reluctantly a part of. New characters include (as mentioned before), the dubious trader Nefreeti, and (as Peta would say) the free-spirited Ninetta who is linked to Terinu's past. But this is just the beginning, and I can't wait to see where things go. I'll sum up by saying the artwork is extremely crisp, clear and detailed, with no short-cuts taken (such as over-shading, commonly used to hide an artist's insecurities). The flow is smooth and natural, as is the dialogue. This is top-rate comic material, easily comparable with the professionalism and heart of Wendy Pini's ElfQuest; Colleen Doran's A Distant Soil; Teri Wood's Wandering Star; Tara Tallan's Galaxion -- and any of the other accomplished, dedicated female comic book creators whose work highlights just how captivating and inspiring a comic book should be. Peta Hewitt has made her mark in the history of Australian comic books, and if she chooses to do so on a worldwide scale, I'm sure she'll have all the success she deserves. You go girl!